Sometimes Jozy Altidore is electrifying. Other times he isn't. Watching him figure it out, though, is never less than great. I found myself watching Dutch league football at 5am. I’d set four alarms, roll off my bed, and open my computer into Western Europe. Some nights I wouldn’t sleep, and I’d stare into the night, desperate to be sure I could enter that world. Sleep, sleep, tweet, goal, sleep. But when my eyes opened on those early mornings, the sense of achieved consciousness didn’t arrive. I felt myself half-dreaming, somewhere far away from a college dorm. I was somewhere in the elusive heart of Holland, with Jozy Altidore as my guide. It’s less strange than it sounds. America is not a great soccer nation, and that’s a beautiful thing. The 14th best team in the world has only a minor place on the global stage, despite the blustery geo-political strength the United States brings into that distant zone. It is not much more important in domestic sports circles. People care, but not too many or too much. The fan of American soccer has a unique opportunity, though: to support an American team that, in most significant competitions, is just another squad. If and when the U.S. captures greatness, if and when Michael Bradley wears the World Cup crown, confetti covering his bald head like uneven hairs, it will not be a fulfillment of expectation or capitalistic birthright. It will be a day of surprise and overachievement. Such a championship may not be one entirely made of underdog fantasy, but it will symbolize burgeoning growth: a new American west, with quite a bit less atrocity and guilt. Among American soccer players, there is and always has been a certain magic about Jozy Altidore. Few players have demanded such early attention and frequent double teams. At 18, he dismantled MLS foes; at 19, he scored the winner in a Confederations Cup semifinal, against a Spanish national side that did not know defeat for 25 games. No goal represented the uneven joys of early Altidore better – the strong positioning, the brutally calm turn, the powerful but mostly average finish. All was present during the biggest game of his career. The 19-year-old Haitian-American, so promisingly imperfect, decimating a Spanish defender and sprinting to the corner flag, arms held high in eternal question. The next two years were not altogether kind to one of the most exciting prospects in American soccer history. His then-record transfer to Spanish side Villareal – he later broke his own record fee this August – quickly sputtered. The club sent him on loan to a nascent Premier League team desperate for attacking options, Hull City. And while the prospect of a 20-year-old American featuring for a team in the world’s best league certainly had its appeal, the failure that followed was undeniable. Altidore was a better player for Hull during his brief stint than many remember. He drew penalties and sometimes linked well with teammates in the box. But he did not score goals, and his touch lacked the energetic control many Premier League fans look for so keenly. Such is a striker’s life in Europe – failure is considered to be both readily apparent and attributable to that one struggling striker alone. But no story of American hope is complete without some carefully placed redemption. Thankfully, in this case, there is the Dutch league and its fast-paced disregard for stringent defense, its love of open play and the counter. The move to AZ from Villareal brought Altidore back to a circumstance ripe for ascension. And so he climbed, sometimes over defenders, sometimes past their betraying bodies, and sometimes simply through. He was great again. In Holland, they named their children Jozy and screamed his name from stands of red. With every contest, Altidore’s goals echoed the sublime, his emerging skill more thundering with every strike. To see Altidore score had always been one thing; to watch as he dismantled four defenders and finished cleanly into the side netting was quite another. It was old and new and sweet, and worth the strange wake-up time. On the pitch, Altidore burns and fades, mixing exuberance with the oddity of disappearing runs behind the defense. When Altidore scores, there is true celebration. When he has not, and the 80th minute has come, a rash challenge may await the legs of an unsuspecting opponent. Yes, he plays with fire, but he does not yet control the flames during moments of particular competition. Altidore’s personality outside the game includes an unassailable combination of maturity and careful publicity. There is a level of great awareness and removal within the tweets and blogs of Altidore, who occasionally allows for a show of emotional support, but typically reveals himself with a great deal of straightforward reserve. This is an understandable outlook for a player of Altidore’s fame and position – worldwide soccer media haphazardly tears down controversial players, and Altidore may simply feel no allure for public statements beyond the simplicity of congratulatory or deferential response. Such a considered demeanor can gain in positivity for what it lacks in true insight, both in the scope of his own being and broader social considerations. The recent spotlight on racism in soccer – notably seen in Italy and Netherlands but elsewhere as well – has shone partially due to the maturity of Altidore. In a Dutch Cup game last season, Altidore faced racial abuse from the opposing team’s fans, but carried on playing – a choice he explained after the game – and scored a goal, all while conducting himself with all the aplomb, reserve and general admirable maturity imaginable. Altidore has since positioned himself on the world stage as a leader against such systemic racism. This is who Jozy Altidore is, now. The consumption of cross-Atlantic soccer via monitor is an often a fuzzily frustrating experience, but any restless soul who dared the early morning Dutch waters experienced a particular reward. Altidore’s performances were overwhelming in a twofold sense – not only did he shine as the best player on the field for many games, but he also succeeded in the face of past failures, putting years behind him with every cool finish or breakneck header. Altidore threw every weakness behind his wake, his touch always improving and his timing impeccable. AZ were a team built on wing play, on the forward patience of young midfielder Adam Maher – but more than anything, the team of 2012-13 belonged to Altidore. He seized it all. None of this necessarily meant a thing, of course. 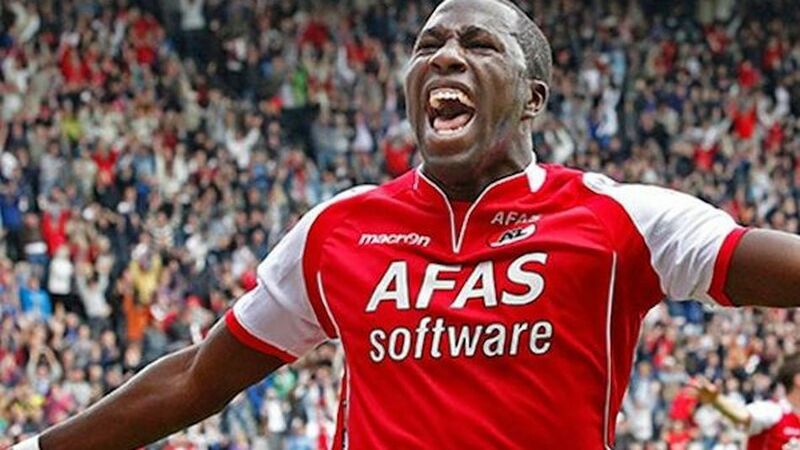 Altidore scored 45 goals in 73 appearances over two seasons, kept AZ from relegation and helped secure a Dutch Cup, but the season held little other significance. The Dutch league has produced productive scores before, many times. But few American field players have impressed as much as Altidore did that season in a high-tier foreign league. The short list includes the 2012 play of Clint Dempsey, who achieved poaching and creating catharsis for the Premier League’s Fulham. But while Dempsey’s season was more impressive, Altidore’s career loomed far from its peak. He could only improve, could only confuse Sergio Ramos more and more with every passing year. There were no limits for him, no heights he could not reach. Even the arbitrary weightiness of “world-class” seemed within reach. If we are to assign a theme to the relatively short career of Jozy Altidore, an idea of imbalance emerges. Imbalance haunted his game during his earliest years, imbalance that he methodically eradicated with the help of AZ coach Gertjan Verbeek and United States manager Jurgen Klinsmann. Into this notion of imbalance we can also place Altidore’s early relationship with Klinsmann. Altidore maintained the best club form of his career to that point in 2011 and 2012, Klinsmann’s first two years on the job. But frictions on the international level between Klinsmann and his protégé were noticeable. Altidore’s play on the field for the national team was often listless and indeterminate, the opposite of his play for club and a source of frustration for Klinsmann, who at one point elected not to bring Altidore into the squad for key qualifiers. But after Altidore’s volley against Germany found the net, renewing his confidence in the coolness of spring, the second redemptive shift of his career followed. Altidore scored eight times in 11 games for the U.S. over a four-month period, including a defining performance against a solid Bosnian side. Greatness for club and greatness for country intertwined – and more so, balance existed. To borrow from the sage words of Kevin Garnett, anything was possible. And then Jozy Altidore went to Sunderland, back to the cloudy country of his initial failures. Sunderland narrowly avoided relegation in 2013, and this year American owner Ellis Short invested heavily in Altidore and others like Italian international Emanuele Giaccherini. In the North of England, they hoped for mid-table glory. It is fair to say that glory has thus far eluded the team. It’s maybe even generous to put it that way. Sunderland, under the now-departed manager Paolo Di Canio, radiated every glum memory of Stoke City experimentation and dreadful football at its most pure. Midfield play was reduced to drudging travesty, former Manchester United centerback John O’Shea artfully mixed the slowest of movements with the most indigestive of long passes. Sunderland football as a whole became a horrible thing to watch. Altidore, along with the team’s conglomerate, failed to score. Despite a change in management and an improvement in play, largely due to the central midfield injection of Korean international Ki Sung-Yueng, the latest Great American Hope has scored just once in 14 league appearances. Whether paired with Scottish international or playing as a lone striker, no great success has yet come. Opinions are split on whether Altidore has played well despite his lack of tangible production, but the intangible remains secondary. At Sunderland, one of the most talented players in American soccer history searches for a hint of success, and we wait, our minds racing, still misplaced underdogs dreading obscurity. In the twisting streets of Bosnia, there is a whispered tale about Jozy Altidore. If you find yourself near the third-closest pub to Sarajevo’s aging stadium, go inside and introduce yourself as an American. They will greet you warmly and serve you two-percent milk. If you stay awhile, they will ask you some questions. Who is this man? Where has he gone? Please ask that he never return. It’s hard to know how to answer just yet. Connor Huchton writes for ESPN's Hardwood Paroxysm and The Two Man Game. He also writes fiction and would like you to follow him on Twitter.